Bullfight Scene, 1960 is taken from a bullfighting collection produced for a Spanish publication called La Tauromaquia (The Art of Bullfighting) which came out in late 1959, with a sequel in 1961. 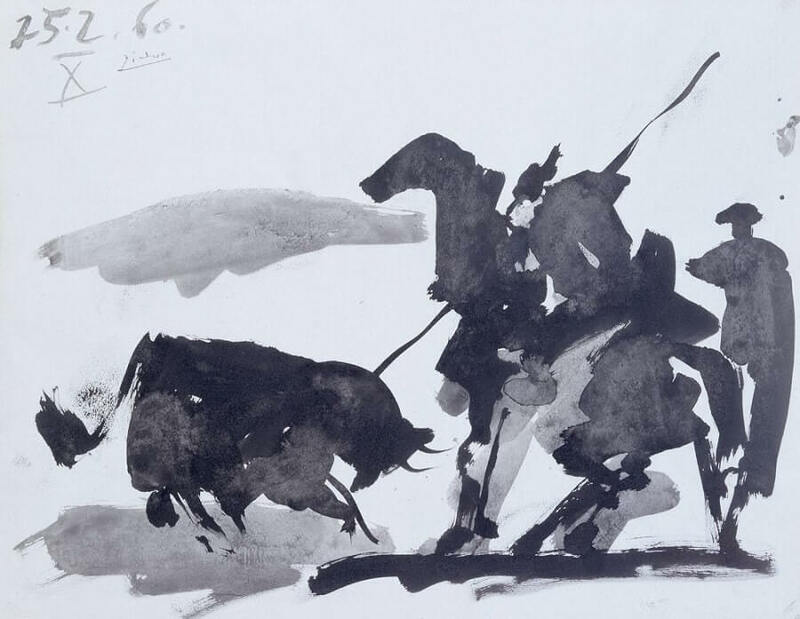 Picasso worked on the project regularly during this period, beautifully recreating animated scenes from his lifelong passion of bullfighting. The publication also enabled him to re-examine a variety of engraving print methods, including etching, dry-point and aquatints, as well as pen and ink. Dry-point etching is the use of a steel stylus on unpolished copper plate so that ink is caught in the scratched copper 'burrs' to create a characteristic bloom to the line. Aquatint uses acid in the etching combined with stopping techniques so that darkening degrees of tone can be achieved. The process allowed Picasso to concentrate on capturing a moment with more realistic detail. The techniques involved great focus and precision and the results are stunning. The black and white format reproduces delicate images instead of the brutality of the bullfight, and captures its supposed motic appeal.